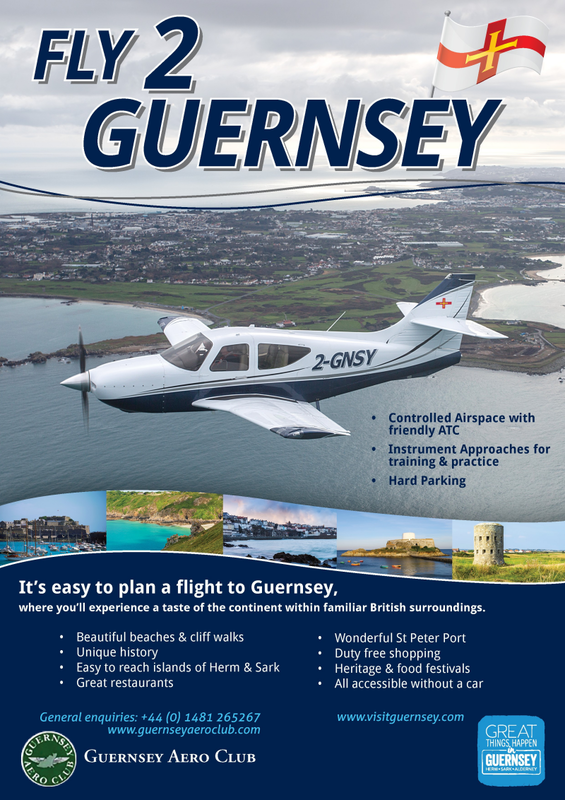 In order to reduce the risk of delay, re-routing or extensive holding, flights inbound for Guernsey requiring a VFR or "Special" VFR clearance should plan entry along notified recommended routes. These have been established in order to keep VFR traffic clear of any restricted areas, deconflicted from IFR Departures and Arrival tracks and to deconflict with other VFR/SVFR traffic transiting to/from the other islands. Inbound flights to Brecqhou and Jethou should book CI CTR PPR in the same manner as those for Guernsey. From the MP entry can be planned via Pointe de Rozel (ROZEL) and the Fort Le Marchant (FORT) Guernsey. In order to plan a more direct route west of Danger Area D036 it is possible to fly direct from The Needles Lighthouse on the Isle of Wight to ORTAC (ORTAC). Please take care to remain clear of or below the airway Q41 (Base FL35) north of ORTAC. 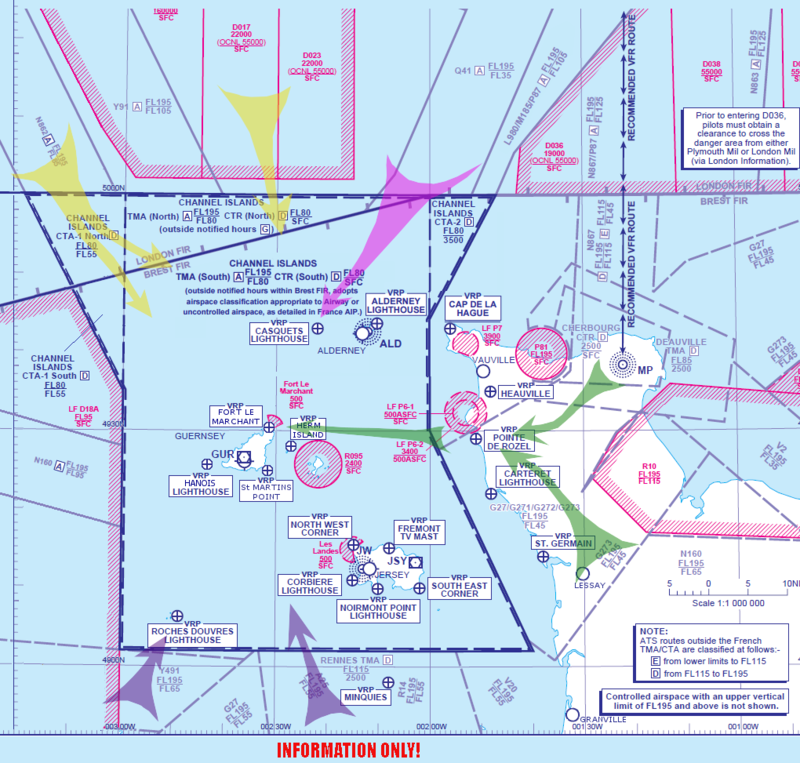 The following Noise Abatement Procedures apply to all aircraft arriving at Guernsey. Please Note: This is a summary of the local noise abatement procedures and Pilots should review the textual elements of the Guernsey Section of the UK AIP for comprehensive procedures including those required for departure. Every operator using the airport shall ensure that at all times aircraft are operated in a manner calculated to cause the least disturbance practicable over all parts of the island. Unless ATC otherwise authorise, the Noise Preferential Routeings and Procedures specified below shall apply to all aircraft approaching and landing at Guernsey in accordance with the ATC clearance and shall apply in both VMC and IMC. (i) MTOW 5700 kg or less – join the final approach at not less than, and maintain, 836ft amsl (500 ft aal) until intercepting the on glidepath PAPI indications. (ii) MTOW greater than 5700 kg – join the final approach before crossing the coastline. Any aircraft overflying the Island to position on final approach must do so at an altitude of not less than 1500 ft amsl. Circuit Joining and Training Height – Standard circuit height is 700 ft aal. All aircraft are to avoid overflying the Princess Elizabeth Hospital (2 nm ENE of the aerodrome) at less than 1000 ft agl.